Tags: idle, champions, update, event, Midwinter, K'thriss, spotlight, Acquisitions, Acq. Today we're talking about our newest Champion: K'thriss Drow'b, the Drow Warlock of the Great Old One, and the latest addition to Idle Champions joining us from Acquisitions Incorporated: The "C" Team! K'thriss will be available in our next Year Two Event, Midwinter, which launches on Wednesday, January 16th. I hope this blog will give you all you need to know about our latest Support champion. Don't forget that Midwinter is also a chance to collect and gear up Regis, the Halfling Rogue from R.A. Salvatore's Legend of Drizzt novels! K'thriss is unlocked by playing Midwinter, a limited-time event launching on January 16th and running until January 28th at noon Pacific. Once you unlock K'thriss, he swaps with Bruenor and Deekin (Slot 1). Curious, affable, and morbid, the Drow heretic K'thriss Drow'b seeks the insane god-truth behind the veil of reality. As the "C" Team's hoardsperson, he keeps an eye out for occult relics that could aid him in his unearthly quest. 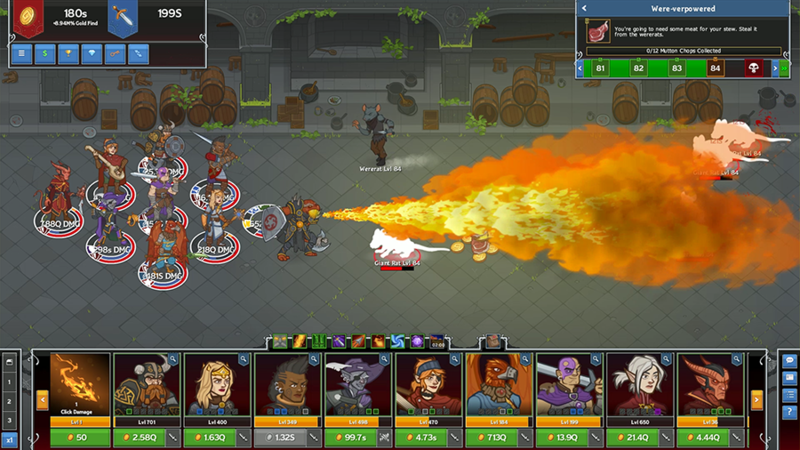 K'thriss is the second member of The "C" Team to join Idle Champions. His pal Donaar Blit'zen was the first back in October with Liars' Night 2. And yes, we will be looking to bring Walnut Dankgrass and Rosie Beestinger (who has an interesting connection to Strix) to the game in future updates. Stay tuned! K'thriss was created by Kris Straub for the main-stage Aquisitions Inc games at PAX. Eventually he broke off from the main crew and joined his forever family: The "C" Team. We chatted with Kris about what makes K'thriss tick and how best we could integrate him with the Champions. In the end, we landed on a quirky champion who supports the team by usurping a percentage of gold (he is a hoardsperson, after all) to buff party DPS, and helps those furthest away from him. Base Attack - Dissonant Whispers: K'thriss telepathically whispers a discordant melody that damages and slows a random enemy. Formation Ability: Hoardsperson: K'thriss' first formation ability unlocks his Acquisitions Inc role as Hoardsperson. As the Hoardsperson, K'thriss reduces gold find by 10% (causing cool pink coins to fall from all monsters that go directly to him. In exchange for taking 10% of the gold, K'thriss increases the damage of all Champions. In addition to that, every time K'thriss collect 75 of the cool coins, he summons a shadow demon. 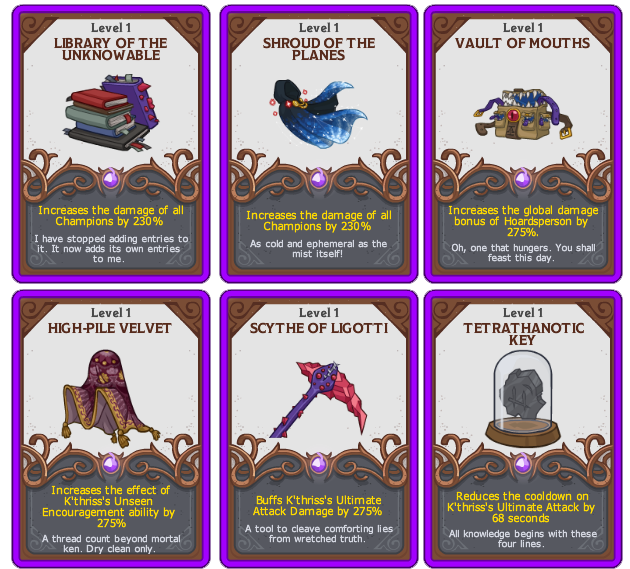 The demon attaches itself to the champion that does the lowest damage, and increases their damage to match the champion with the highest damage. Formation Ability: Unseen Encouragement: K'thriss increases the damage of the Champion furthest from him by 200%. If there's a tie, all Champions furthest from K'thriss are buffed! K'thriss' specializations are all about deciding whether the party needs him to focus on bringing his shadow demon along more often, or focus on buffing the Champion(s) furthest from him. K'thriss' ultimate was a bit challenging, but we knew we wanted to bring our version of Tentacular Spectacular into the game. The big issue was making sure that he didn't look like a flasher when he executes his plan! With Tentacular Spectacular, K'thriss opens his cloak, revealing the inky black void underneath (is he even a person!?!). Then, tentacles sprout from the void, lashing out at enemies. What that means in our game is a hilarious cloak opening animation complete with jazz hands, followed by a SWARM of tentacles throughout the battlefield. It's really a sight to behold. K'thriss' thirst for knowledge increases the damage of all Champions. Kthriss' cloak increases the damage of all Champions. His Acquisitions Incorporated mandated bag increases the effect of his Hoardsperson ability. 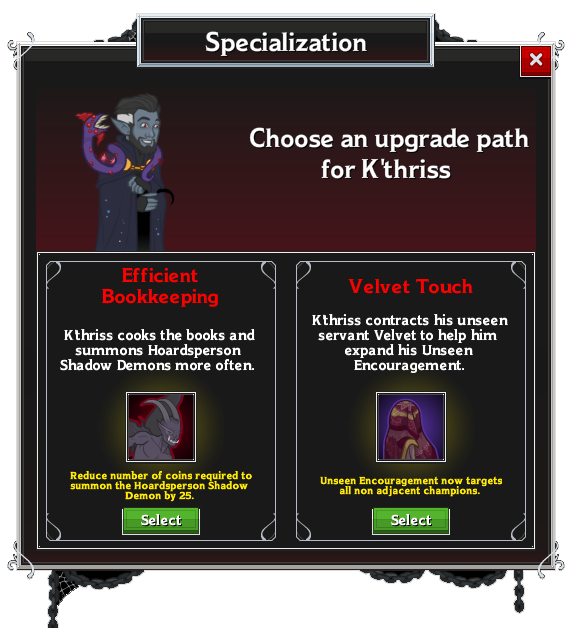 K'thriss' Unseen Servant Velvet increases the effect of his Unseen Encouragement ability. His sentient tentacle/pet increases the damage of his ultimate attack Tentacular Spectacular. The symbol of Ur reduces the cooldown of his ultimate attack Tentacular Spectacular. Are there any other K'thriss details I should know? 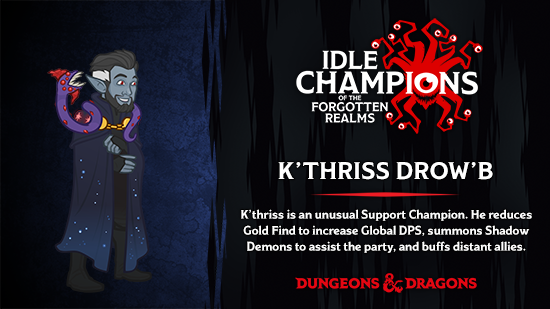 K'thriss is a support champion focussed on increasing the overall DPS of your champions through his Shadow Demon via Hoardsperson and through his Unseen Encouragement abilities. He'll help slow enemies as they head to your formation, and he'll try to clear the board with his Tentacular Spectacular ultimate ability. We'll be watching the discussion online and on discord to see how well he's received, so let us know what you think on Facebook, Twitter, or on the official Discord! If you are enjoying K'thriss, consider checking out the "C" team broadcasts! 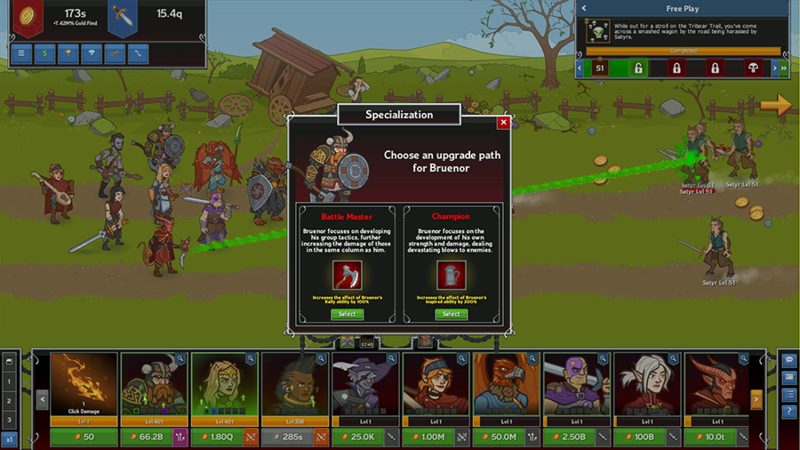 Tags: idle, champions, early, access, event, liars night, krond, donaar, acquisitions inc, c team. "It was quite the party: fun, festive, and perhaps a tad too much ale. But then some masked jerk managed to sneak in and take off with a bunch of our magical items! Can you help us?" It's all fun and games until someone loses their magic items — now it's time to get the Party back together for another Liars' Night! Liars' Night 2 runs until Monday, November 5th at 12:00pm Pacific, introduces Donaar Blit'zen, the Dragonborn Paladin, and also brings back the new-and-improved Krond, the Half-orc Eldritch Knight! This copper, draconic gentleman claims to know more than one hundred different dragons. 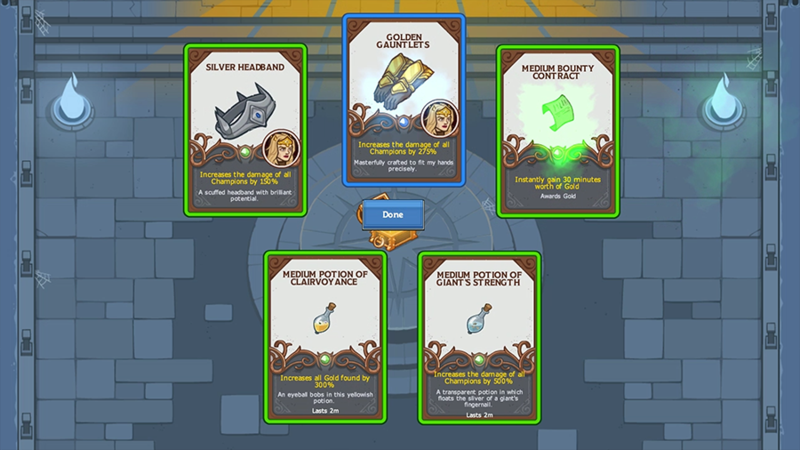 Chromatic, metallic—just tons and tons of dragons—I’m hoping we can leverage some of these connections in our dealings. None of the dragons I’ve contacted have gotten back to me, but they’re probably just very busy right now. This is one of the busiest times for dragons… or so I’ve been told by my new best friend, Donaar Blit’zen. Donaar is a Support/Healer Champion. 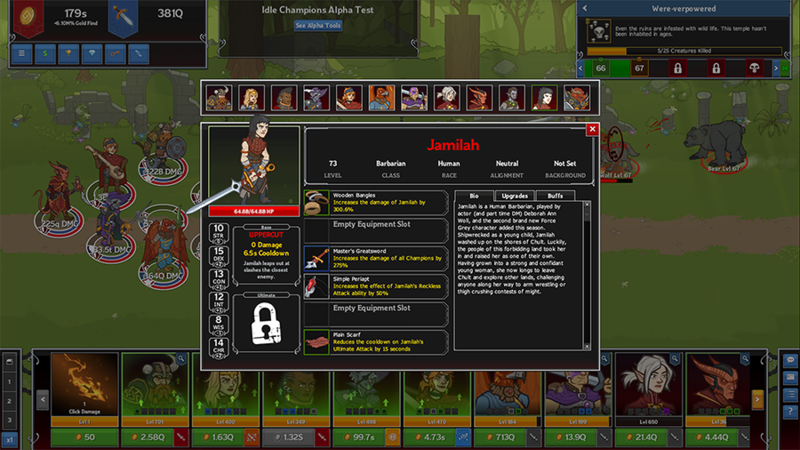 He uses his Command ability to debuff enemies, while also healing damaged Champions and buffing those behind him. When you want to add Donaar to your party, you can swap him with Celeste or Regis (Slot 2). 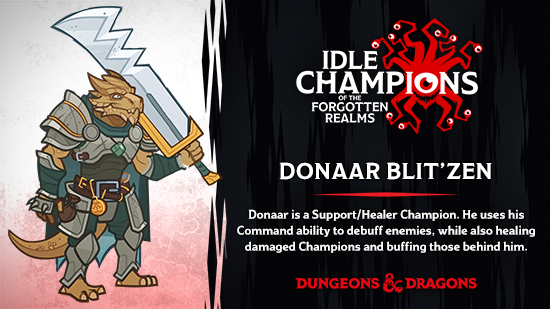 For more information about our latest Champion, check out the Idle Champion Spotlight - Donaar dev blog! Born to an academic human wizard who was researching an orc tribe and the leader of said tribe, Krond has experience in both worlds. Raised as a fearsome warrior, he began focusing on the arcane arts after his mother was killed in a goblin raid. Krond wears intricate leather and cloth armor and carries a bonded warhammer. Krond is a versatile DPS Champion, able to choose one of three DPS specializations. Krond's formation ability, Survival of the Fittest, increases his DPS for every strong (STR 16+) or evil-aligned Champion in the formation. 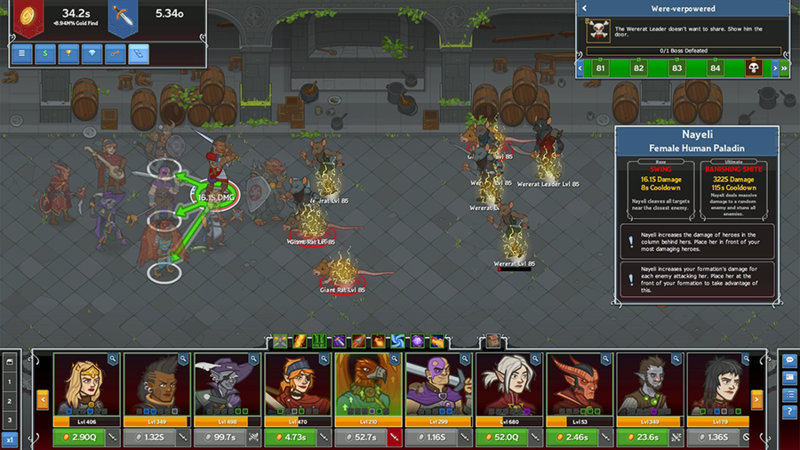 When you want to add Krond to your party, you can swap him with Asharra or Evelyn (Slot 6). 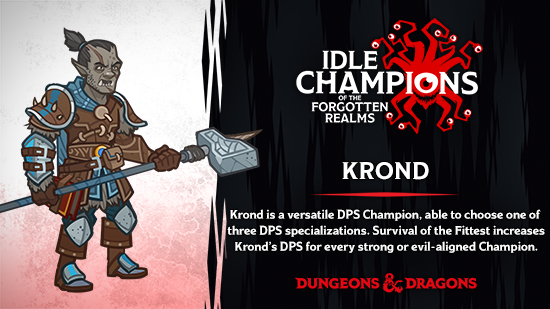 For more information about Krond, check out the Idle Champion Spotlight - Krond dev blog! The Chaotic Decisionist — Donaar has decided that he's going to lead the way on his first adventure. Donaar starts this adventured unlocked and in the front of the formation, and he has decided that he can't move from that location. Only Champions with a chaotic alignment can be used. Nightmare Fuel — A flaming scarecrow spawns in every Area. After each encounter with the Masked Man, an additional scarecrow will spawn every Area, stacking cumulatively. Pirate's Night — Bruenor tried to bring the fun for Liars' Night by dressing up as a pirate. Unfortunately, a drunken sailor has mistaken him for another pirate who owes her some money. She spawns in every Area with one of four different special abilities. Bruenor is locked into his Pirate Bruenor skin for this variant, which unlocks for you once you complete the adventure. Stealthy Pickpockets — Invisible pickpockets spawn and sneak towards the formation, becoming visible after five seconds. When they reach your formation, they steal 2% of your total gold each time they attack. Costumed Foes — A variety of costumed humanoids enemies attack the formation, each with different special abilities. It's Getting Darker — The night gets even darker, with each successive area getting darker and reducing your gold find while monsters gain additional health. See the in-game FAQ for more information!